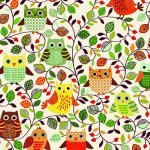 Fun and easy quilt kit to take with you wherever you go! Quilt Size 72" X 84"
This project is quilt as you go! Works with Sue Daley's Quilt As You Go Hexagon Templates Size 4" and 5"
The girls have been to Market and have brought back a plethora of neat and exciting projects for you! This year's Quiltapalooza will be featured for three days in our classroom from Thursday through Saturday, June 18-20, so that many may enjoy! Market items purchased over the three days will be 10% off. Anyone who comes and visits our Quiltapalooza "store" may enter our drawing for one of four Fabulous Market Baskets full of goodies. 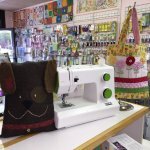 Kid's Sewing Kamp at Happiness Is ... Quilting! This is a great opportunity to expose the next generation to the wonderful world of sewing and quilting! 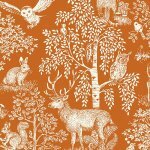 Students will create an animal pillow and learn their new machines in the first 2 - day class for only $275. Sign your little one up today! Come back for the next 2 - day camp class, Monday, June 29, where students will make a flower tote bag, for only $25. (Students must attend the first camp to participate in the second session. Smarter by PFAFF 140's are required for camp). Come into Happiness to receive your FREE Row by Row Experience 2015 Block Pattern from June 21 thru September 8, 2015. 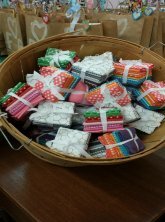 We will award a bundle of 25 fat quarters to the first customer who brings in a completed (quilted, bound and labeled) row quilt using patterns from at least 8 different shops. The Challenge expires October 31, 2015. Go to the Row By Row Experience for more details. We hope to see you soon! Isn't our block ADORABLE?!?! Penny did a great job designing it! Row By Row 2015 License Plates are NOW available for sale! Don't wait, they'll go fast! Welcome Trey White to our Happiness Family! Come by Friday, June 19, from 12-1 and you will receive a free pack of Inspira Needles (while supplies last). And while you're here schedule your PFAFF yearly service cleaning. 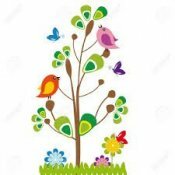 The next meeting for Farm Girl Breakfast Club is Saturday, July 4th, from 9-11. There are only 15 spots so sign-up early! 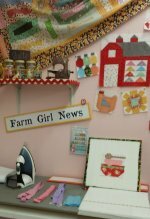 Farm Girl Vintage Towers are available HERE! Farm Girl Vintage Fat 1/8th Bundles HERE!